Vega Johannessen is a Norwegian designer who is with MESH on a four month internship. 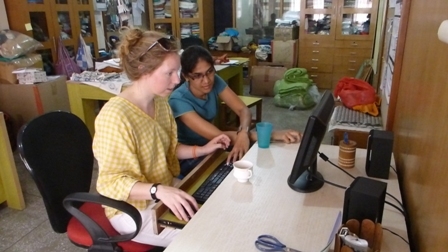 Her first project is to design a range of block printed tea towels. The look should be contemporary but use the skills of the block printers in Sarthik Manav Kusht Ashram (SMK), a leprosy community in Jaipur. 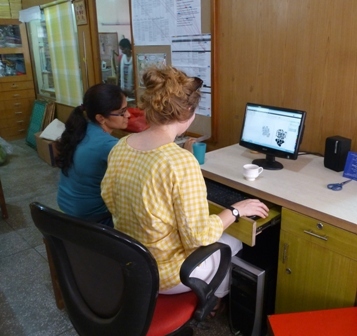 Vega has prepared the designs and she and MESH designer, Syamala are working out the finer details together ready to send them off to the block maker. MESH Design Studio welcomes interns from Indian colleges of design as well as those selected by IM Soir, in Sweden from amongst Scandinavian designers. Vega will get an opportunity to develop products, visit our suppliers in different parts of India and try out some new skills. For now though there are some fun geometric designs taking shape...we shall be back with more news as she progresses.